Like most people, I got started with trains at a very young age. 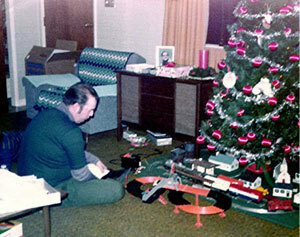 I just loved setting up my Dad’s Lionel Trains at Christmastime under the tree. I still put a train under the Christmas tree every year. My Dad always helped with the train and made sure my brother and I took good care of it. "A Tribute to my Father"
I could see them from my backyard. I could hear their horns sounding for the crossing. I was hooked; I love trains. Every Christmas Season, we would set up Dad's Lionel Trains. they were great and I wished for my own model trains. Dad bought my brother and I our first train set when I was 7 years old. I was thrilled!! Every day I wanted to run my trains. Dad encouraged us to build a train display in our basement. We visited many displays close our home and he often took me to local hobby stores to buy more trains. It is in his memory that this train store is dedicated. Brian's Model Trains is located in Myerstown, Pennsylvania about 35 miles east of Harrisburg. We have been in business for over 15 years and continue to be more than just a local train shop. We sponsor events like Ride the Rails for Cancer twice a year supporting Vickie's Angel Foundation who helps families financially while going for Cancer treatments. We also open our Toy Train Layout during the Christmas Season and more !! Check out our events page for more information. There is something for everyone at Brian's Model Trains !! We are fully stocked with train sets, track, accessories, publications, scenery, structures, locomotives, rolling stock and so much more. Take some time to stop by today! Copyright ©2019 Brian's Model Trains. All Rights Reserved.